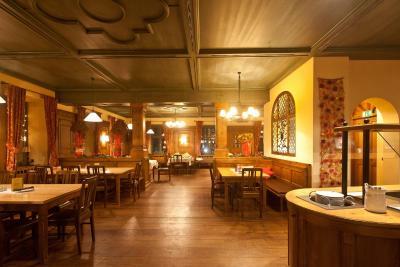 Lock in a great price for Klosterbräuhaus Ursberg – rated 8.6 by recent guests! A typical small German hotel. Clean, comfortable beds, great breakfast, good wifi, best if you have a car. Not in a business district. Staff were accommodating, restaurant was fairly priced and good, although a limited selection. Great pride in their beer. Very good location for travelling through the area. Friendly staff. Nice place for a walk after supper. Clean, comfortable and well equipped rooms. Lovely country side hotel. Friendly staff, great breakfast and good dinner possibilities. Excellent for a family stay. So welcoming to us & our dog. Friendliness, great food, comfortable room, easy parking, accommodating in every way. Despite we arrived late around 11:00 pm, the staff has asked us if we have had diner. I assume that they were ready to cook something for us. We still have had the possibility to enjoy some beers at the bar. Das Hotel und das Gesamtgebäude passen zueinander - sehr ansprechend. Mein Zimmer war einfach, aber funktional ausgestattet und groß. Die Lage war sehr ruhig. Das Restaurant mit dem Ursbacher Bier ist eine Klasse für sich. Ich habe mich insgesamt sehr wohl gefühlt. Ruhige Zimmer, nettes Personal. Sehr hochwertiges Frühstück. Sehr freundliches Personal gute Küche und ein sehr gutes Bier !!! Klosterbräuhaus Ursberg This rating is a reflection of how the property compares to the industry standard when it comes to price, facilities and services available. It's based on a self-evaluation by the property. Use this rating to help choose your stay! 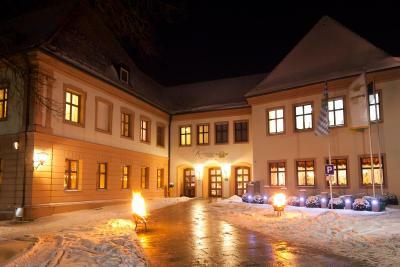 This traditional hotel stands beside Ursberg Abbey, in the Bavarian district of Günzburg. 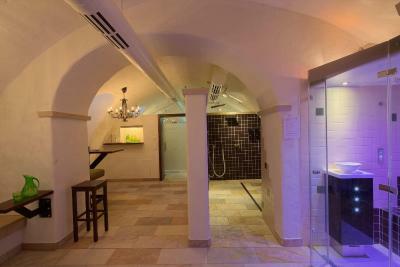 It features a brewery, a restaurant as well as a new spa area with Finnish sauna and steam room. 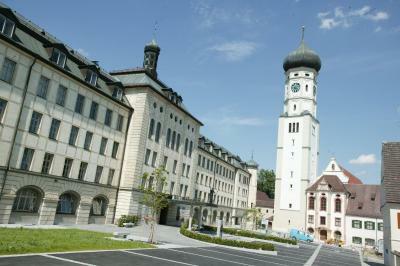 All modern rooms at the 3-star-superior Klosterbräuhaus Ursberg include cable TV and a private bathroom with hairdryer. A Nintendo Wii video game console are available from reception. A breakfast buffet and warm drink are provided every morning. The restaurant serves hot food from 11:00 until 21:30. There is also a beer garden and children's playground next to the restaurant. Located in the center of Ursberg village, Klosterbräuhaus is an ideal base for cycle trips through the hills of Central Swabia. It is 4.3 mi from Schloss Klingenburg Golf Club, one of the most beautiful golf courses in Bavaria. A wakeboarding facility is 1.2 mi away. The hotel is near Legoland Deutschland, and just a 40-minute drive from Augsburg. 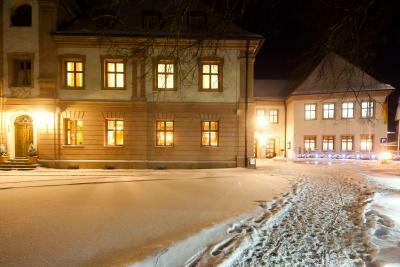 This property also has one of the top-rated locations in Ursberg! Guests are happier about it compared to other properties in the area. This property is also rated for the best value in Ursberg! Guests are getting more for their money when compared to other properties in this city. 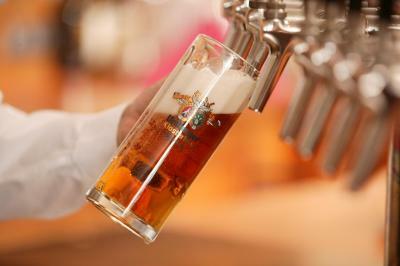 When would you like to stay at Klosterbräuhaus Ursberg? Bright room with light wooden furniture and cable TV. House Rules Klosterbräuhaus Ursberg takes special requests – add in the next step! Debit card Klosterbräuhaus Ursberg accepts these cards and reserves the right to temporarily hold an amount prior to arrival. Klosterbräuhaus Ursberg accepts these cards and reserves the right to temporarily hold an amount prior to arrival. If weather continues to be so hot they'll need to think about air-conditioning.